- Publisher How do we prove the existence of God? The second volume in the Reason and Religion series tackles head-on this fundamental question. It examines a cross-section of theistic proofs (ways of proving the existence of God) which have been offered by theologians and thinkers from Anselm to Paley, explaining in clear terms what theistic proofs are and what they try to accomplish. The book goes on to explain the relationship between theistic proofs and religious realism, the cosmological and teleological arguments for the existence of God, the position known as foundationalism and the argument from religious experience. About "God Reason and Theistic Proofs"
How do we prove the existence of God? The second volume in the Reason and Religion series tackles head-on this fundamental question. 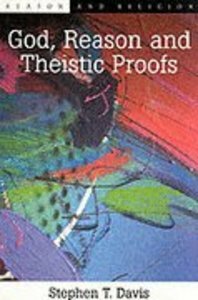 It examines a cross-section of theistic proofs (ways of proving the existence of God) which have been offered by theologians and thinkers from Anselm to Paley, explaining in clear terms what theistic proofs are and what they try to accomplish. The book goes on to explain the relationship between theistic proofs and religious realism, the cosmological and teleological arguments for the existence of God, the position known as foundationalism and the argument from religious experience.